I much admired the recycled E-Type Jaguar that did so well in the recent Brighton-to-London Future Car Challenge, having had its straight-six engine replaced with an electric motor and a load of lithium-ion batteries. Toyota’s beautiful 2000GT coupe was Japan’s riposte to the E-Type when it went on sale in 1967, and now one has undergone its own electric car upgrade. I’d be able to tell you more if I could read Japanese, but the Crazy Car Project has taken an early example 2000GT and ejected its 2-litre inline six. Transplanted in its place is a 35kWh lithium-ion battery supplying a 120kW (161bhp) electric motor, which sends drive to the rear wheels. To keep the battery topped up, the bonnet now features a large photovoltaic solar panel, while translucent solar cells have also been integrated into the rear windscreen. If I’m reading the translation right, the sound of the original engine is piped into the cabin in response to speed and pedal inputs, to preserve the original car’s character as much as possible. And I think the top speed is a robust 200km/h (124mph). The interior has also been modernised with a new battery gauge supplementing the original instruments, bio-fibre carpets and a rear-view mirror that doubles as a digital information screen. The project has been undertaken by the Toyota Auto Fan Club, which looks as if it includes quite a few Toyota engineers – but whether they’ve done work in their spare time or on the payroll I can’t tell you. 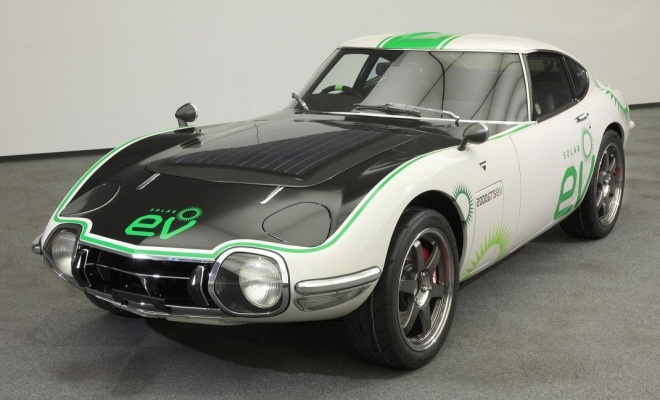 The 2000GT Solar EV has just been put on show at the 2012 Tokyo Auto Salon – the world’s largest custom car show.